Nostalgia Off, Propeller Cap On. Magical isn't a word I throw around loosely. There really aren't many games or series that come off as magical when you play them. The Super Mario Bros. games, on the other hand, are exactly that. They may vary in degrees of magic, but most often than not you're getting a whimsical journey that touches upon what memories of nostalgia are made of. It's been a few years shy of two decades since we last saw a console 2-D Mario. Sure, games like Super Mario 64 and Super Mario Galaxy are excellent 3-D platforming adventures, but you can't escape the fondness some of us have for 2-D wonder. Thankfully, the wait is over as New Super Mario Bros. Wii has hit the planet like a foot stomp to a goomba. There are no cute rhetorical questions like, "Is New Super Mario Bros. Wii a superstar, or will it need a pack of 1-ups to survive? ", as this new 2-D adventure delivers in spades. Our story begins with Mario, Luigi, Princess Peach, and two of her Toad guardians celebrating a nice celebration of some type inside Peach's castle. A giant cake is delivered, but oh-ho! The cake is a lie. Instead, Bowser Jr. and the seven once long-forgotten Koopalings pop out of the cake, capture the princess, and dart off with her to an airship with Mario and the gang giving chase. This is our story, and it's a simple one. Check out J.K. Rowling if you want something whimsical and meaty in your stories. This time, Mario doesn't have to be alone this time if you choose not to. For the first time in a Mario game, there's full multi-player functionality. There's no online which may frustrate some, but seeing a PS3 title stumble with four players online in LittleBigPlanet, that may be for the best. The first player must always be Mario, but a second, third, and even fourth (if you're feeling particularly crazy), can jump in and out on the world maps at any time. The choices for the playable characters seems odd. There's Luigi, of course, but the other two are a pair of no-name Toads, one blue and one yellow. Perhaps someone like Toadette could have been the fourth player, but that's purely nit-picking. Regardless, I actually found the game much easier with two players than while working alone. Four-player games were reserved for solely fun as there's constant bumping, running into one another, getting into each others' ways, et cetera. With two players, you can actually use the game's mechanics against it. For instance, there was a valuable item down near a bottomless pit. Traditionally, you'd use the propeller suit to jump down into the chasm, shake the Wii remote, and fly back up to safety. We didn't have the luxury of such an item. Instead, one of us leaped into the hole, grabbed the item, and just before the suicide jumper would die, he'd press A and fall into a safety bubble. These bubbles can be used strategically when players need room to maneuver, or a section is too difficult for the other players to complete. However, if every player winds up in a bubble, you have to start back from the beginning of the level or at a continue point. Having two heads is definitely better than one, while other times, t's a hassle. Tower levels are made more difficult. In single-player, if you fall down to a place in the level you've already been, the screen scrolls down normally with you. Not so in multi-player. Instead, the screen stays put, and your falling character will fall down as if he entered a bottomless pit, losing a life. When a player loses all of their lives, they can no longer continuing playing until the level is complete, and they get a whole new set of lives to work with. Now, back to the bonuses of having more than one player playing. Item boxes generally only give out one item in single-player, but in multi-player they erupt with as many items as there are players. Getting certain items would be much more difficult alone than with a buddy. There's one level where you have to scurry to keep up with a bullet bill. You need to keep up because you need it to bounce off of to reach a higher platform where a secret is. In multi-player, you can just bounce off the head of one of your friends, and reach the platform without that pesky enemy! This time around, Mario has a lot of new items in his repertoire. Standards like the mushroom, fire flower, and star return, as does the mini mushroom from New Super Mario Bros. for the DS. This annoying item doesn't serve as much of a purpose as it did in the original NSMB. Only a few levels require it to reach a secret, and this time, the mini mushrooms are in the levels where the secrets actually are. (Take that, DS Super Mario Bros.!) 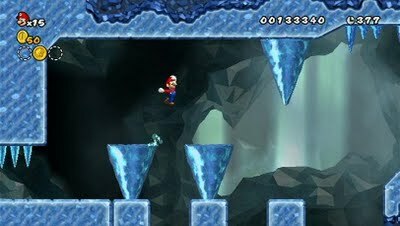 New to this version of Super Mario Bros. is the ice flower, which can freeze enemies allowing Mario to leap on top of them, perhaps reaching otherwise inaccessible items and areas. There's also the penguin suit which while running, Mario can leap on his belly and glide, as well as swim much more easily. He can also use iceballs to freeze enemies. Finally, there's one of my favorite power-ups in any Mario game - the propeller suit. I talked about this one a little earlier, but here's how it works. You shake the Wii remote up ever so smoothly, and your character propels into the air, hovering down to the ground. It's great to use the suit to get past problematic platforming perils with ease. And while not a power-up in the traditional sense, there's everyone's favorite dinosaur pal, Yoshi. Yoshi operates pretty much the same way as in Super Mario World except in New Super Mario Bros. Wii he can flutter in the air, a la Yoshi's Island. Unfortunately, Yoshi is underutilized as he only appears in about four or five levels throughout the entire game. He can also not accompany you to other levels, which is okay as that would make said levels much more manageable. Eight main worlds encompass the adventure, and they just beg to be explored fully. Each level of the game's near-eighty levels is brimming with secrets, obstacles, enemies, hazards, and surprises. The fact of the matter is that each level is masterfully designed, and they're one cohesively enjoyable experience. Super Mario Galaxy had plenty of moments, but they were strung together by small interruptions of standard platforming. Not New Super Mario Bros. Wii. This game packs a punch from beginning to end. It grabs a hold of you in the very first level with new surprises such as rotating pieces of land, and it doesn't stop. It doesn't let go. One level you think can't be topped, and then the next single-handily destroys your expectations. It's a phenomenally designed game. Old and new are mended together wonderfully in New Super Mario Bros. Wii. Remember those spiked pillars that would smash you in Super Mario World? 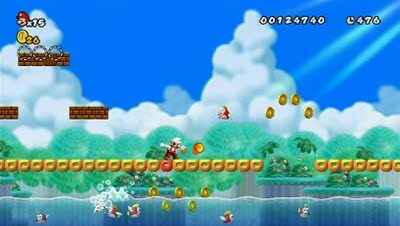 Now they're even larger in New Super Mario Bros. Wii, spinning and churning with rapid rotations. Airships from Super Mario Bros. 3 return with three levels of challenging platforming action. They were always the most impressive and difficult levels in Super Mario Bros. 3, and they're no slouch in this version of the series either. Enemies old and new are ready to get in your way too, from fire-spitting piranha plants, to punching and pummeling poltergeists. Adding to the mix are giants, ghostly boos, ball-chucking spikes, plumber-consuming fish, sledge, fire and ice-throwing hammer bros, and many, many more. Just like Super Mario Bros 3, you can hoard items and use them on the overworld map. There's even challenges when you encounter an enemy on the world map where you must collect ten Toad balloons before you perish, and Toad-saving missions where the goal is to bring Toad all the way from the beginning of the level to the end safely. Each of the eight worlds have a series of ordinary levels (well, as ordinary as they can be in this game), a ghost house, a tower where you face a Koopaling in an easy(ish) battle, and a castle where you face the same Koopaling in a fiercer fight. For example, in Wendy O' Koopa's first battle, there's nothing in terms of challenge, save for her throwing golden rings of doom. In the second encounter with Ms. Koopa, the chamber changes from flooded to unflooded as you try to avoid her rings and damage her. 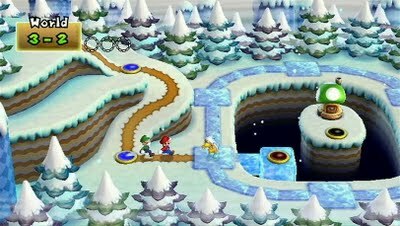 Each world map has multiple optional paths which are home to item-bestowing mushroom houses, 1-up houses, and starman-giving houses. Secrets aren't just on the overworld maps either. They're very much in the levels, too. 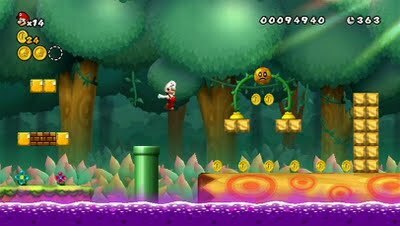 Every level has three star coins resting in each level. Some are hidden well, some are kept in precarious places, while others are in plain sight ready to be collected. These can be used to purchase super skill videos where the CPU shows off in the game's various levels. Perhaps there's something greater for gathering star coins in every level of the game? Additionally, some levels house hidden exits. These usually open up the way to warp cannons that will allow players to skip huge chunks of the game, but with how much virtuosity these levels show and contain, why would you want to? Controlling Mario or whichever character you play as feels great. It's a little more loose than Super Mario World, and small things like being unable to kick shells upward are missing. Regardless, overall the game is superb. Something I was concerned with was inadvertently moving the Wii remote, and causing an action I didn't want to happen. Thankfully, this was a worry unwarranted. There were only a couple of times where such an instance happened. The Wii remote is also used to control a spotlight in one level but tilt and move platforms in another. These work well, but I can see criticism for a lack of classic control support. Nonetheless, the Wii remote by itself is the optimal option. The final piece to the New Super Mario Bros. Wii puzzle is the Super Guide. What is it? What does it do? Can I just let it play the game for me? Can it slice and dice my tomatoes? If you're having trouble with a given level, Super Guide will play through the level for you. However, it only pops up after you've perished eight times in one level. It won't collect star coins, or get secret exits for you, but it's merely optional anyway. It's a fantastic addition to make the levels as difficult as the designers wanted. Another beef some might have is the overabundance of 1-ups players will receive. If you just have five lives the entire game and used them all up in an especially difficult level, you'd have to redo the level all over again. Perhaps you'd make it near the end and lose all your lives once more. Having so many lives allowed the designers to concoct dastardly levels and reward the player. I imagine having only five lives to deal with would give many players, new and veteran, not too much frustration. New Super Mario Bros. Wii is a bright and charming game with plenty of colors, awesome animations (such as enemies dancing in time to the music), and breath-taking backgrounds. The game runs at a smooth clip without any problems, and it looks fantastic. The soundtrack is a mix of old and new tracks - many from Super Mario Bros. 3 and New Super Mario Bros. for the DS. I'm happy to announce that it's a much more enjoyable and lively soundtrack than the DS incarnation. Many tunes you'll be humming and tapping your toes to. 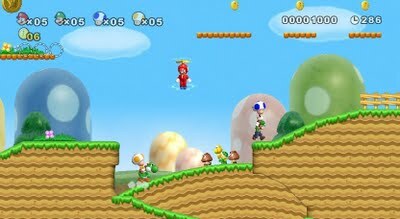 If there was one game that I could call magical this year and mean it 100%, it'd have to be New Super Mario Bros. Wii. Nearly everything fits together like a nicely-designed jigsaw puzzle. Sure, a piece or two might have been less-than-gently squeezed into place, but the package as a whole is brilliant. The levels are constantly surprising, challenging (especially the later worlds), and the game is a blast to play alone or with friends. One isn't better than the other-- they're just different experiences and ways to play. Without a doubt, New Super Mario Bros. Wii is one of the best games released for the system, and perhaps even a greater 2-D Mario than Super Mario Bros. 3, nostalgia goggles off.